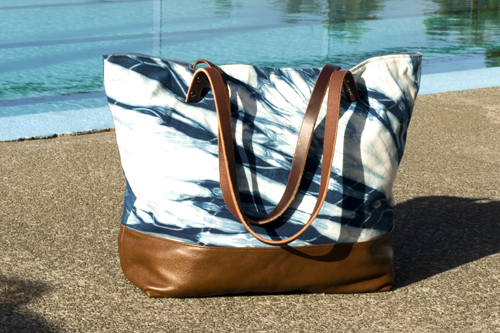 Shibori and leather tote by Liz Ambrose. Photos courtesy of Liz Ambrose. 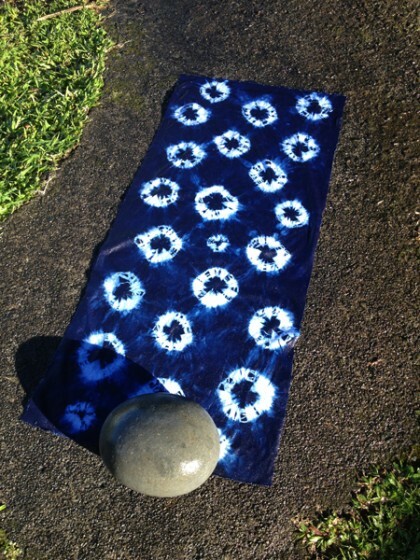 Liz Ambrose of Hilo is, in her words, “obsessed with indigo.” I so get that! As regular readers know, I am in love with indigo. It’s just such a soul-satisfying thing to get my hands into a vat of the magical navy dye! Liz is an artist, textile designer and indigo dyer who is trying to start a handbag business. She has created prototypes for several totes, a cross body bag and a clutch. However the brand new entrepreneur ran out of money and could not afford to order more leather. So she did what many talented (but poor) designers in Hawaii have done in recent years: She began a Kickstarter campaign. The campaign ends in eight days – on December 23 – and she is currently at 81 percent of her goal of $5,800. Want to help? Go to www.inikoa.com. (“Inikoa” means indigo in Hawaiian.) The website will take you directly to her Kickstarter campaign. Each shibori bag is different, as they are hand dyed. 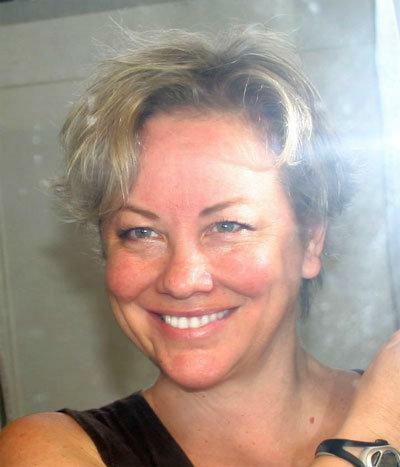 Liz’s love for indigo developed as she grew up overseas, living in villages in Korea, Brazil, Okinawa and Haiti. Her father worked for an organization that’s similar to the Peace Corps. Although she was originally an oceanography major, Liz went back to school in 2002 as an art major. There was no textile course at U.H. Hilo so she created her own curriculum and worked from textile text books. Liz first started making scarves, however she found that “Scarves are not the first thing to fly off the shelf here and I couldn’t find the right texture of silk with the right volume,” so she started making handbags. “I got online and took a tutorial and taught myself and took it from there,” she said. The bags are made of twill, white denim or canvas, with leather bottoms and handles. She is currently looking for heavy hemp and linen as alternative fabrics. She sources the leather in Chicago and offers a vegan alternative with canvas bottoms and handles. Liz hired a seamstress to teach her to sew the bags and bought an industrial sewing machine designed to sew heavy fabrics and leathers. It’s all a very homegrown, self-taught effort. To make the indigo colorfast, Liz washes it three or four times after dyeing. She also Scotch Guards the bags when they are pau. She is working with a company called Ultra Everdry as they finalize a fabric stabilizer that could be the answer to her prayers. Handbag designer Liz Ambrose of Hilo. If you are familiar with Kickstarter, you know that it’s an all or nothing campaign. If Liz does not raise the entire $5,800, she receives nothing. Let’s help her get this line of handbags going!